California is experiencing a historic drought. I am proud to partner with Scotts® for this sponsored post to talk about their latest product that can help Californians preserve water at this critical time. Since the beginning of the drought in 2010, most Californians have become aware that there is a drought by this point. With recent discussions and advertisements by the state and various counties, the sense of urgency has increased as it has been declared we are in a severe drought. However, there's a lot of confusion amount residents when it comes to what they can do about it. Not many people are aware of all of the different ways that they can help reduce water usage in their household and preserve this precious resource. The reality is that with no end to the drought in sight, we don't have any of this liquid gold that we can afford to squander. The drought began shortly after I moved to Canada to be with my husband. Hearing about the drought and the affect it was having on farmers and residents in California really had an impact on me, even while I was abroad. I knew even towards the beginning of the drought the types of drastic and difficult changes that may eventually become necessary as the drought continued. Especially considering the significance of agriculture in California, it meant there were some tough times ahead. Sure enough, farmers have been faced with the difficult decision to let some crops go, focusing their time, energy, and resources on crops that are more profitable and, in many cases, require less water. We moved back to California in August of 2014, and immediately made changes to our lifestyle in regards to water usage to adjust accordingly. We evaluated our habits and immediately gave up cloth diapering, and started saving and using grey water to water the garden plants. We generally increased our awareness of how much water we were using, and looked for any areas where we could cut back. Not all water saving techniques require a drastic, or even significant, change in lifestyle, but instead take minor adjustments to habits. For example, I only turn on the tap to a slow, steady stream rather than cranking the knob and allowing water to gush from the faucet when I wash my hands, brush my teeth, or take a shower. These little adjustments were about tweaking habits that were, honestly, excessive and wasteful to begin with---drought or no drought. We also switched to a more water efficient toilet, which believe it or not saved a significant amount of water, reducing our bill by more than $50 a month! Perhaps you invested a lot in landscaping, or in your lawn. You can't stand to see it all turn brown, and that's holding you back from letting your front yard and/or back yard go in an effort to conserve water. I completely understand! But what if there was another option? A way to save water and still allow your lawn and landscaping to thrive? Scotts® EveryDrop™ is a great way to make every drop of water count. Scotts® EveryDrop™is a unique formula of wetting agents that acts as a water maximizer. No matter how you water the botany on your property, using Scotts® EveryDrop™minimizes wasteful and unnecessary runoff and pooling that occurs during watering. Did you know that well-fed plants use water more efficiently? Using Scotts® EveryDrop™ can help you reduce the water used for your lawn and/or landscape by up to 25%! 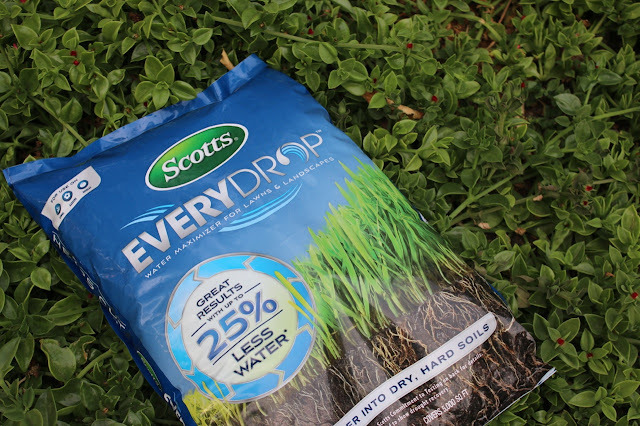 Activated when it comes into contact with rain or irrigation water, Scotts® EveryDrop™gets to work immediately. 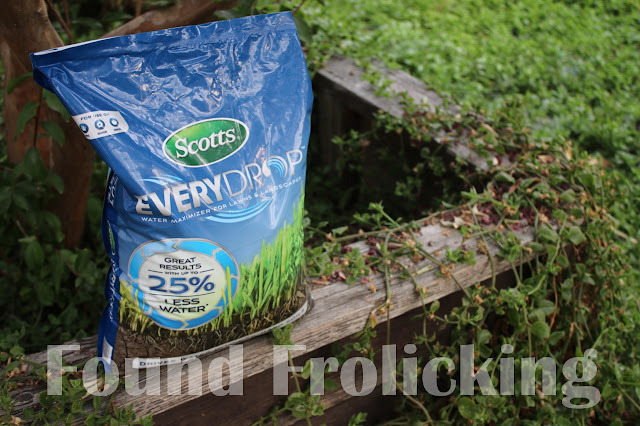 Best applied to your soil in the early spring, Scotts® EveryDrop™will prepare your soil for the stresses of summer and help your landscaping cope with and make the most out of water usage during the drought. 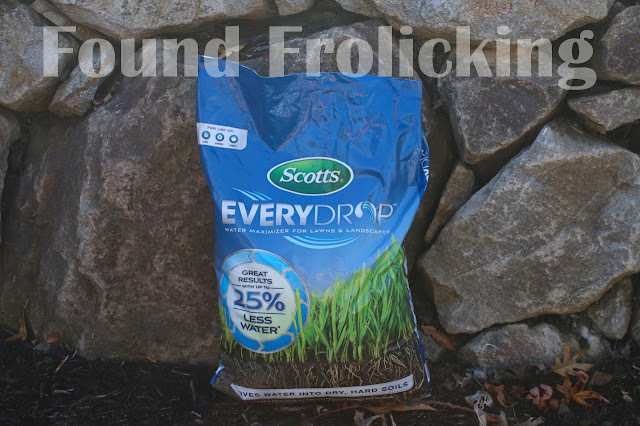 Applying this granular formula to your soil on a monthly basis throughout summer and into early fall will allow you to maximize the benefits of using Scotts® EveryDrop™. You can find tons of amazing tips and tricks to get the healthiest and most efficient system for plant care directly on the Scotts® website. Recommendations on the best time to water your lawn and landscaping, tips on how to make and keep your plants healthy, and so much more. Are you ready to make every drop count? You can conveniently find Scotts® EveryDrop™products at retailers in California including Orchard Hardware Supply, Lowe's, and Home Depot. Start making the most out of the water we have by looking for Scotts® EveryDrop at a store near you! The 10 lb. bag of Scotts® EveryDrop™! 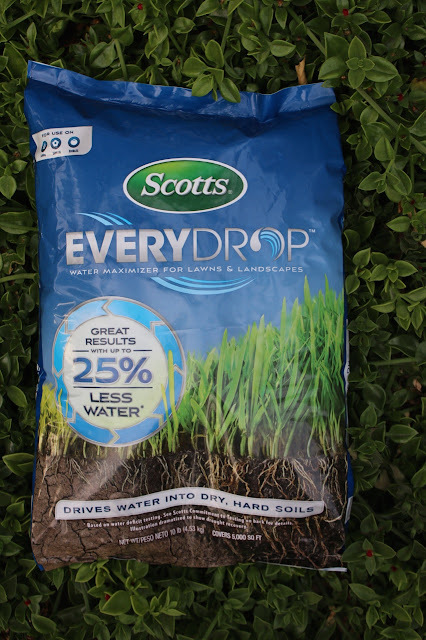 Use up to 25% less water when using Scotts® EveryDrop™on your lawn and landscaping. You can also find Scotts® EveryDrop™in a 3 lb. shaker jug and a liquid spray, giving you just the options you need. Start making the most of your water use today. Look for Scotts® EveryDrop™ products at a retailer near you! Disclosure: This is a sponsored post written by me on behalf of Scotts® EveryDrop™. I received product and monetary compensation in order to facilitate this content. All opinions expressed are my own, and were in no way influenced by the brand or any other sources. The post and all photos with the watermark are the property of Found Frolicking, and should not be used or distributed in any way without first receiving permission. Found Frolicking is in no way responsible for prize shipment, but will work with the sponsors in all ways possible to ensure the winner receives their prizes. Find out how Found Frolicking can help promote YOUR business! If you would like to work with Found Frolicking for a review, giveaway, advertising, or promotion of any other nature, please email Lalia at found.frolicking@gmail.com. What an innovative product! I feel terrible for those in the drought! I think that EveryDrop would be good for anyone to use in order to save water supply for all! Its good for the environment! I had no idea Scotts made this. Great idea. We used to live in CA and hated when water was being rationed! I can't even imagine! I'm glad this exists to help conserve what there is. This seems like a briliant idea! Whiile I don't live in CA and have to worry about a severe drought, it's really good to be more water conservative regardless. We are out of drought (probably not for long) I have not heard of this but I think is will be good to have. I didn't realize that well-fed plants used water more efficiently. That makes sense though. I'm glad there is something to help work with the situation out there. It's scary bad! I need this for my lawn too. In Texas, by the end of summer our grass looks horrible. It's brown and gross unless you spend tons of money watering it. I was never good at taking care of a garden or even potted plants, so this is all very new to me. Thanks for the information though, maybe this will help me more when I decided to give gardening another chance. This is such a great product. We even had a drought watch this year in Wa State. oh this looks really cool, i'll have to look into it more! I had no idea you guys were in a drought. Glad there is something to help. I love the Scotts brand so many great products they have. I have zero gardening skills, and reading about this gives me a better idea on how to take care of plants. Thanks for sharing this information! Hehehe I honestly am clueless about yard stuff! This stuff sounds like it gets the job done though! My grandmother would love this, she always taking care our garden. I need some of this is our yard. Our yard is brown. My husband loves gardening so much. This sounds like a great product & it is good to see we have some solutions on the way to manage the drought to a level at least. We need it for our garden.